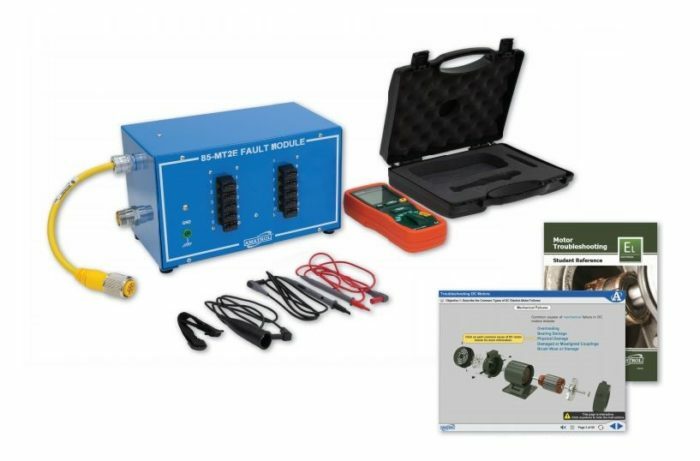 The Motor Troubleshooting Learning System (85-MT2E), used in conjunction with Basic Electrical Machines (85-MT2), covers AC and DC motors troubleshooting and testing using a multimeter and a megger meter. The skills and knowledge covered by this system will prove invaluable for industrial maintenance technicians or anyone working in a field that uses AC and/or DC motors. This system covers major topics like AC and DC motor failures, common methods of diagnosing these failures by using a multimeter and megger meter, and troubleshooting these failures. Motor troubleshooting includes a motor connection box to practice hands-on skills such as troubleshooting faults in a DC motor and AC single-phase and three-phase motors, evaluating DC electric motor commutator and brush health, and using a multimeter to test an AC motor start/run capacitor. Amatrol’s industrial training systems feature real-world, industry-grade components for durability that will stand up to frequent use and to allow learners to gain real-world competencies. This system requires Basic Electrical Machines (85-MT2), a digital multimeter, and a megger meter. Motor troubleshooting features a motor connection box that, when used in conjunction with the Basic Electrical Machines, a multimeter, and megger meter, allows learners to practice hands-on motor troubleshooting skills. This learning system covers a wide variety of areas where failures can occur within AC motors (bearing failure, start windings, centrifugal switch, thermal switch) and DC motors (couplings, brushes, armature, field winding, and power supply). This array of topics allows learners to gain confidence and competence when practicing applicable hands-on skills and to see how they translate to real-world situations. This industrial motor training system’s curriculum begins by explaining common types of AC and DC motor failures and causes and builds by allowing learners to study how to test, diagnose, and troubleshoot these problems. Specific objectives include listing common failures of a three-phase AC motor’s stator windings, understanding common methods used to diagnose DC motor failures, and using a megger meter to test a DC electric motor armature. The included curriculum is interactive multimedia that can be used for classroom teaching or self-paced learning. This multimedia features stunning 3D graphics and videos, voiceovers of the text, and interactive quizzes and exercises. Motor troubleshooting is just one option for electrical motor training from Amatrol. Other options to add onto Basic Electrical Machines include DC Generators (85-MT2B), Alternators / Synchronous Motors (85-MT2C), and Wound Rotor Motor (85-MT2D). DC Generators features resistive and inductive load units to teach the operation, installation, and selection of DC generators for various applications. Alternators / Synchronous Motors includes capacitive load, combination synchronous motor/ alternator, and synchronizing lights / switch unit to cover topics like alternator output voltage and frequency, three dark synchronization method, and reversing a synchronous motor. Wound Rotor Motor includes a wound rotor controller and motor to cover topics such as speed controllers, motor reversing, and performance analysis and measurement. A sample copy of the Motor Troubleshooting Student Reference Guide is also included with the system for your evaluation. Sourced from the system’s curriculum, the Student Reference Guide takes the entire series’ technical content contained in the learning objectives and combines them into one perfectly-bound book. Student Reference Guides supplement this course by providing a condensed, inexpensive reference tool that learners will find invaluable once they finish their training making it the perfect course takeaway.